February 20 was TWENTY years from the exact event that set us on our current course. TWENTY years. I’ll be perfectly honest here. It’s been a long, hard twenty years. While the events of that particular day will probably haunt me (us) for the rest of our lives, there’s no real point in dwelling on it...and it certainly isn’t cause for a celebration. If you want the abridged version, read THIS one. But, the fact that we’ve made this work for twenty years is indeed noteworthy. And, I will say this...we made the best of an awful situation...and I’m proud of all we have accomplished. Since a holiday usually means some good deals, we decided to take advantage of our “slow” time and do a little truck shopping. The farm truck had been showing some serious signs of age for quite some time. I mean, it IS Twenty years old, so geriatric issues were to be expected. But, it no longer seemed dependable for longer hauling trips, so it was time to look for a replacement. Surely, we could find something “new” that would fit the budget. When we rolled onto the first lot, the first truck that caught our eye had a sign on the windshield that said...” HOLIDAY SPECIAL ....$38,900!” Another vehicle said something about a payment of “just” $800mo. I blinked. Surely I didn’t see what I thought I did. But, yes. Yes, that is what it said. We’re not talking new, top of the line vehicle. We’re talking about a used pick-up. Geez. I knew this was going to be expensive, but WOW. But, this one was seriously basic. As, in no upgrades, basic. I didn’t even know they manufactured crank windows anymore. It didn’t ride any better than the old Dodge... And, if we’re going to rack up what seemed like the equivalent of the national debt, I think we should at least get a good radio. So, maybe a newer, better equipped model? After spending the better part of the day searching, learning and dickering with used vehicle salesmen, we started to head back home. The Boss pulled across the road abruptly and we were off and looking once more. However, afternoon chores were awaiting us and there was no time for a test-drive or another marathon bargaining session, so we made plans to return in the morning. 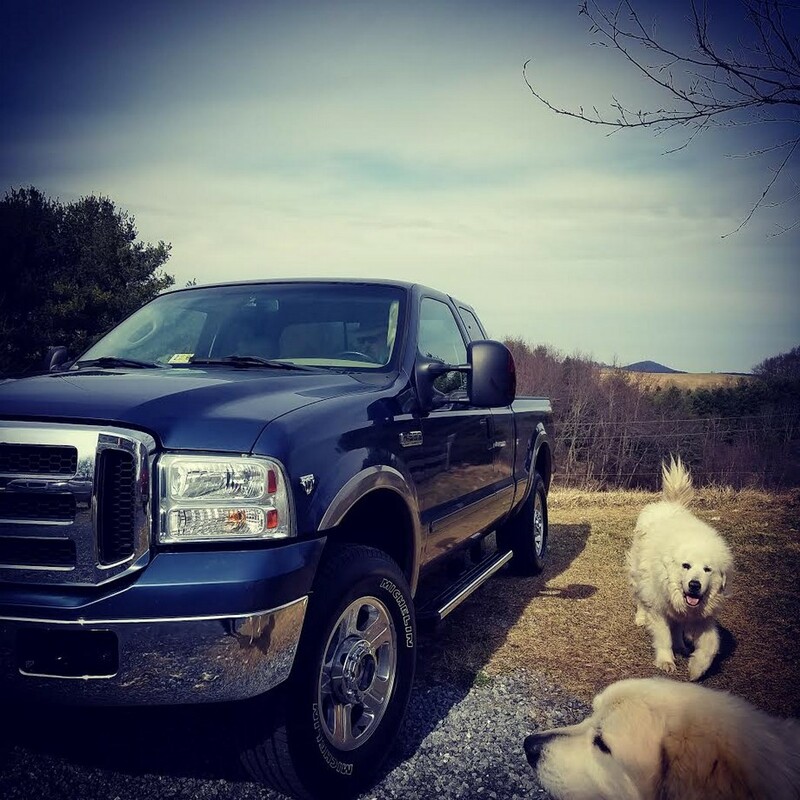 Our savings may be nearly empty, but there’s a nice “new” truck sitting in our driveway (with no payments...thank you very much). The dealer fixed the squeaking brake caliper (no charge) and got a new radio installed (no charge) so the Boss is happy. I even get to drive it while listening to the new radio to the feedstore on my next trip. So, I’m happy as well. I guess we should give a shout-out to Matt and the crew at MasterTech in Staunton. Thanks, y'all! After cleaning up the Dodge, the Boss parked it at the mailbox with a FOR SALE sign on it...and sold it to the first guy who called who wanted it for his son. And now some highschool kid from Gap will be happy, too. After the great truck adventure, my phone rang and an unknown male voice identified himself as “mike-the-mail-carrier”. (and that just made me chuckle) He was calling to inform me that the broiler chicks were at the Staunton Post Office and would be making the trip from town shortly and that I could pick them up in Mbrk within the hour. Well, now...that was a surprise! I had just gotten a delivery email from USPS advising me that they would arrive the following day. Now, the first batch of broiler chicks is now scurrying about the brooder, eating voraciously and growing vigorously. Just eight weeks to fresh chicken at the Market! The only other story around here this week was the weather. I know, I seem to be obsessed with the weather. But, it affects everything. And, I do mean everything. it's really too early for peach blossoms! We haven’t had much winter weather this year at all. And, while I know I’ve written that before, it bears repeating. Those beautifully warm days with temperatures in the seventies are really not so great. All the trees are starting to bud out and many fear what will happen if/when the weather turns cold again. And, if it does not turn cold, what happens to the whole cycle of life deal? Are we in for big shifts in weather patterns? What will that mean to those of us who make our living on the land? Climate changes are indeed a subject that should demand our close attention and concern. The warm temperatures create new challenges in the greenhouses. Ordinarily, this time of year, we are trying to keep the tiny seedlings warm. This past week, the fans have been running well past dark as we try to keep the houses “cool”. Extra diligence is required in keeping everything watered, creating one more item for the daily to do list. So far, so good. I haven’t inadvertently “cooked” anything. Yesterday, a front blew through (emphasis on BLEW) and the weather changed dramatically. This morning the temperatures were back in the twenties and there was ice on the stock tanks. Don’t like the weather? Wait five minutes! We’re supposed to be in for another rollercoaster ride in the temperatures this week. Maybe we will see some rain...we could certainly use that. tax prep tops my "to-do" list this week. Hope you’re having aHappy Sunday! This February is proving no exception. The week began with the kind of news that took my breath away. After I wrote about the loss of a neighbor several years ago,(read this one) I never imagined we ever would find ourselves reeling from a similar tragedy. But, Sunday afternoon brought the news that another of the best and brightest had indeed left us. This time it was the one who had been among the first responders credited with saving my eldest daughter’s life, the one who climbed in that wreck and gave the critical first aid as well as the vital comfort that enabled B to endure the hour-long extrication and overcome the very slim odds that she would even survive the flight over the mountain to the trauma center. She saved us from facing the kind of tragedy that parents can only hope remains horribly unimaginable. My family would not be what it is today without her actions that awful night back in April '10. A special bond formed that night between rescuer and patient, and she and B went on to become great friends. When lights and sirens got in B’s blood, Sherri was there to mentor her and encourage her in her efforts to “give back” to the agency that eventually became her extended family. The close-knit group granted much-needed closure to the traumatic situation as well camaraderie and a sense of community. And, now my eldest daughter’s hero and friend is gone. I’m not sure how I can help my daughter work through her grief as my own memories and issues from that awful night are all jumbled up in the terrible sense of loss. This loss will be felt keenly by a lot of folks for a very long time. It always surprises me that despite the tragedies, life indeed goes on. While the memories and the sadness overwhelm momentarily, other responsibilities demand our time and attention. The routine tasks of farm life certainly don’t stop because we’re sad or worried or bothered about something. 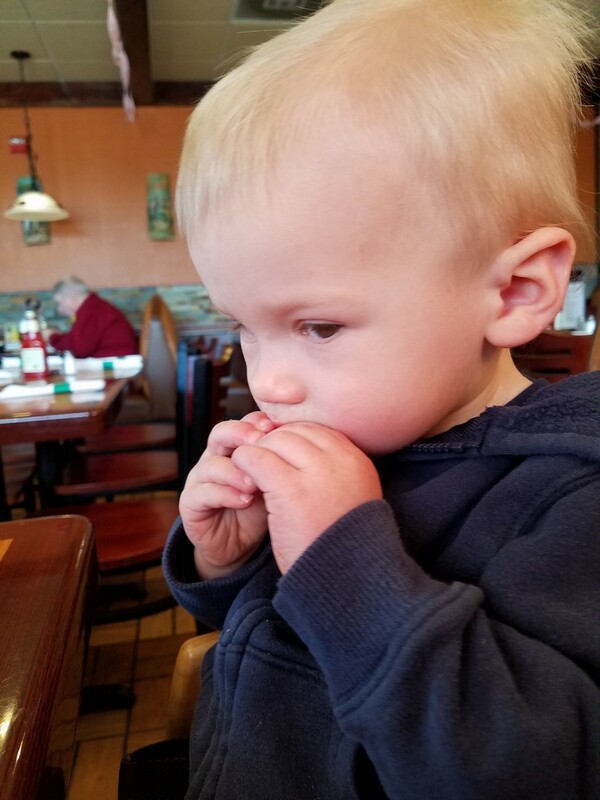 Don't take my french fry, Mamaw! The animals needed to eat, so I headed to town for the feed run. While there, I met up with Blondie and my #2minion for lunch. And, I admit, part of me wondered at myself for being able to giggle with my grandson in the face of such a needless, tragic loss. 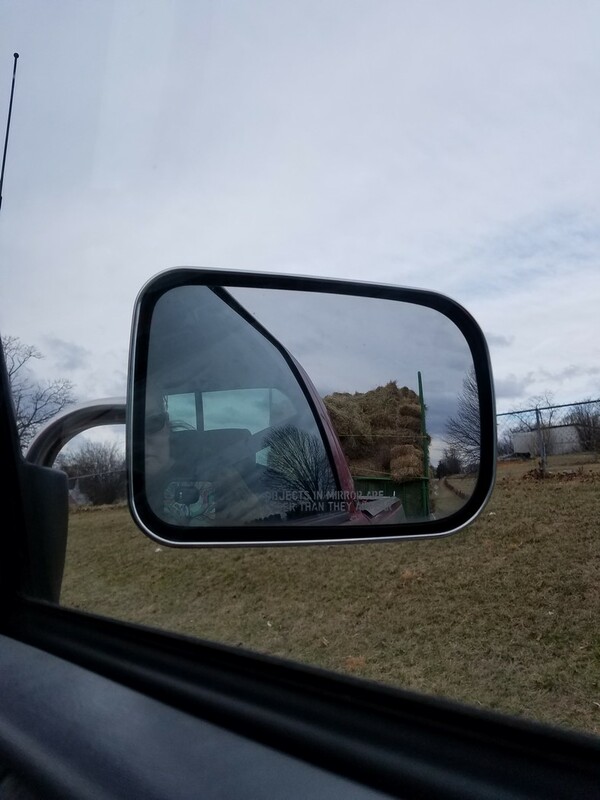 Mid-winter hay hauling is just another inescapable reality of February. There’s not enough room in our barn to store all the hay the ravenous sheep will eat. (for that matter, there may not be enough hay...anywhere) The hay guy holds back a wagonload for us in his barn. It’s just a matter of picking up the hay wagon, unloading and writing a hefty check. With a nod to our aging bodies, we’ve begun to beg a little help for this job. THANK YOU to J & B for helping the old folks out! We can hope that this will last through what’s left of the “winter”. that should last a while! I may have a replacement as "social media director"
he's pretty handy with that mouse! However, if you look in the right places, there were lots of positive things in this week tinged by tragedy. The first ewe lamb dropped her own ewe lamb...with no troubles whatsoever (I missed the event entirely, it was so quick and trouble-free)...and she’s an exemplary mother. The Boss got the hoophouses whipped into shape for the growing season. We can enjoy “weed-free” for a while. Germination rates were great on the early brassicas, so it was time to thin the seedlings. While it seems somewhat counterproductive to pull out some of those healthy little seedlings, it is truly necessary. By leaving just one healthy seedling in each growing cell, we assure a hearty transplant for the garden. Multiple plants in the cell compete for nutrients and never produce as well as a single. Then, there were seeds to start for hoophouse growing. I find working in the greenhouse is truly therapeutic. ...the warmth, the smell of the damp soil, the promise of new life...it’s easy to put all the negative stuff aside. ...and “dirt therapy” is really a thing. I kid you not! There are those who ascribe to the thought that the bacteria in the soil actually helps to elevate mood and overcome anxiety. I’m thinking it’s a real good thing that growing season demands I spend so much time digging in the dirt! …and that was the week on the hill. Thanks for stopping by. come “visit” us again soon. REST IN PEACE, Sherri…you were loved and you will be missed. P.S. Hug your dear ones a little tighter…and if you’re hurting, please, PLEASE talk to someone. take my word for it...it's COLD! The weather has been somewhat temperamental this week. It is quite possible that we had a taste of all four seasons in seven short days. Abnormally warm temperatures gave way to rain and a little snow, followed by one bitterly cold night. ...and the winds... I guess it should come as no surprise that it seems like everyone has been sick. I’m guessing antibiotic sales have been on the increase. (Even I can attest to doing my part to fund the medical/pharmaceutical community lately) Everyone is blaming this on the erratic and unusual weather. In addition, the orchardists are starting to worry about those swelling blossoms on the fruit trees. The constantly shifting temperatures make it next to impossible to keep the crops in the hoophouses flourishing. The lettuce can’t handle the hot days followed by frigid nights and just withers, dies and “melts” into the ground, rendering it useless for sale (and just plain gross). If that weren’t enough, some creature made its way into the hoophouse and effectively destroyed all the kale. Showing no consideration or taste, it ate its way through the chickweed as well. I honestly thought I was seeing things at first. What had been lush and green just the day before was now clipped close to the ground and shows no sign of further growth. An investigation was launched. Beyond a small hole burrowed under the side, we could find no real clues as to the identity of the intruder. The hole was filled, traps were set and plans were made to re-plant. However, this means we are effectively out of the off-season greens market. (which may be a good thing as we really need to focus on new crops for a new season). I’m not sure if the winds were to blame or if Gus and Ellie simply took it upon themselves to do a little gardening, but somehow, they ended up where they really are NOT supposed to be. Not only were they both in the garden area, but Gus managed to get himself locked INSIDE hoophouse #2. (maybe he was hunting the kale-eating intruder) Needless to say, he was most appreciative to get out. However, in his attempts for freedom, his enormous claws tore a couple holes in the plastic skin of the hoophouse. So, now, there’s another entry on the “to-do” list. Despite the changeable weather, or perhaps because of it, we needed to get the pullets into the henhouse to begin their assimilation into the flock. They should begin laying eggs in the very near future so they need to get used to the nestboxes in the henhouse. Speaking of steady egg production, a lot of folks do not understand that hens are incredibly light-sensitive. Egg production naturally drops off with the short days of winter. In some cases, it becomes non-existent. This may be okay if you have a few pet hens. But, for those who rely on egg production for their income, and those who appreciate eating eggs, this can be a real problem. Lights and heat are used in the industry to keep egg production constant. And, before you find fault with this, imagine a world where there were no (or at least very few) eggs, or egg-based products for several months out of every year. With our own egg supply at the lowest level in years, we decided to put some supplemental light in the henhouse in hopes of increasing egg production. The light comes on just before dark and goes off around 10pm. Those few hours of additional light seem to have helped tremendously. eggs freeze (and break) quickly in frigid temperatures. But, Gus doesn't mind...he eats them like popsicles! With the pullets situated, the Boss could clean out the brooder in anticipation of the arrival of baby broiler chicks next week. And, the cycle continues…we are less than 10 weeks from fresh chicken once more! With the countdown ticking away in the back of my mind, I knew it was time to clean up the greenhouses and get the early Spring brassica crop started. On Tuesday afternoon, I seeded about 800 broccoli, cauliflower and cabbage. These will be going into the garden in early April. By Friday (despite 16* overnight) we began to see germination! Starting seeds in our small propagation greenhouses allows us to grow our all own transplants and the benefits are numerous. We have control over variety, timing and quantity. However, greenhouse growing does indeed lead to another area for diligence. Every evening the little seedlings must be tucked in for the night to keep them safe from the cold. And, every morning they must be uncovered so that they do not cook in the heat of the day. We run heaters at night to keep the temperature above freezing, but during the day the temperatures can soar to well over 100* even if it is freezing outside, so it is in our best interest to pay close attention. I have killed more little plants than I care to admit by inadvertently “cooking” them because I was distracted. I can’t tell you how I am looking forward to fresh broccoli! …well, that there is no news. Not yet. The first of the ewe lambs is due to give birth any time. Her ovine sisters will follow suit shortly. The other lambs are growing well, although it seems that there are a number of weather-related issues this season. We have a couple of lambs who have had respiratory issues, a couple more that got chilled (and now are sporting snazzy sweaters) and then there have been indications that parasites may be making an early appearance this year. During the warm weather, the sheep were turned out in the paddock. Nibbling that short grass seems like a great idea, but potentially exposes them to parasites. We administered an anthelmintic (de-wormer) and I’m keeping a close eye on everyone. Parasites can take lambs out of this world very quickly with little warning…so, we stay proactive when it comes to health issues. It pays to stay vigilant. Today, we are under a HIGH WIND WARNING. That means we could experience gusts up to 60mph! (although, I think they are only predicting 40) That also means that I’m going to be giving serious thoughts to hunkering down under the shed with Gus so I don’t have to listen to the wind wailing around the corners of the house and hear the greenhouse moaning and shuddering as the big gusts grab the plastic. Of all the types of weather we experience, WIND has to be my least favorite. Thanks for stopping by…come back and “visit” again real soon.